Get your own personalized dog tags. Each dog tag has room for 5 lines of text with 15 characters per line and can be personalized for the event and/or each person at the event. These are military issued dog tags and come on a 25" chain or a smaller chain for your wrist or backpack. One table, access to electricity (cannot be run from a generator – must be plugged in), one chair, bottled water. Shaded area is requested if outdoor. 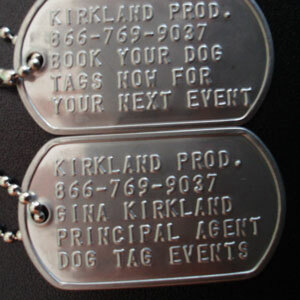 Want to talk with us about Dog Tags?